Contemporary Engineering Economics teaches engineers how to make smart financial decisions in an effort to create economical products. As design and manufacturing become an integral part of engineers’ work, they are required to make more and more decisions regarding money. The Sixth Edition helps students think like the 21st century engineer who is able to incorporate elements of science, engineering, design, and economics into his or her products. 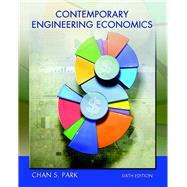 This text comprehensively integrates economic theory with principles of engineering, helping students build sound skills in financial project analysis. This title is also available with MyEngineeringLab — an online homework, tutorial, and assessment program designed to work with this text to engage students and improve results. Within its structured environment, students practice what they learn, test their understanding, and pursue a personalized study plan that helps them better absorb course material and understand difficult concepts. Students interested in purchasing this title with MyEngineeringLab should ask their instructor for the correct package ISBN and Course ID. Instructors, contact your Pearson representative for more information.